Giant 'Bugnado' Swarms In America's Heartland Last month, a cloud of insects the size of a tornado swept across flooded corn fields in Iowa. The eerie, vortex shape earned it the name "Bugnado." 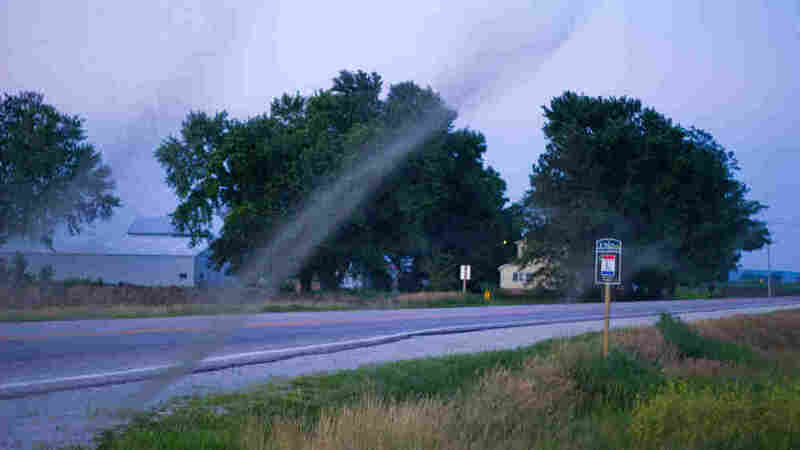 Midge swarms are seen along Highway 30 in Council Bluffs, Iowa. The recent flooding in the area caused a population boom of the tiny insects. In the American Corn Belt this year, the weather has already felt apocalyptic at times. In the last six months, the Midwest has seen record-breaking floods, devastating twisters, unseasonable cold snaps and late heat waves. Now, add insect swarms to these forces of nature. Last month, a cloud of insects the size of a tornado swept across flooded corn fields in Iowa. The eerie, vortex shape earned it the name "Bugnado." A video on YouTube claims to show the bug swarms in action. They were almost surfing on invisible waves of the atmosphere. The phenomenon caught the attention of Joe Keiper, an entomologist at the Virginia Museum of Natural History. He told Weekend Edition Saturday guest host Jacki Lyden that the aquatic insects, known as midges, are relatively harmless and not biblical, crop-destroying creatures. "Fortunately, they really don't do us much harm [though] they can be a nuisance," Keiper says. "You don't want to ride your motorcycle down the road through them with your mouth open." Keiper says one of the only things known about the midge that poses a danger is what it can do to roadways in large numbers. "When they are in great numbers like this, as the bodies litter the road," he says, "there are reports that the roadways become slick just from their presence." Those bodies on the road are typically males that have finished mating, Keiper says. When the midges form these large swarms, much like other insects, they are in mating mode and it is all part of a huge reproductive situation. "The males are essentially nothing more than flying sperm packets, and they will fertilize a female and shortly afterward will die and fall to the ground," he says. "Once the female has mated she's going to go and find a body of water within which she can drop her eggs." The recent flooding in the area turned the corn field into an aquatic habitat, Keiper says. The organic matter from the corn plants fertilized the water, making the perfect bug food for the midges and their offspring. "So really, it jazzed up the bug populations to such a high level that I'm predicting that's why we saw the huge numbers that was produced," he says. So despite the nuisance of the bug swarms and the potential for bug-slicked roadways, Keiper says the swarms don't pose a real threat and were actually lovely to watch. "They were almost surfing on invisible waves of the atmosphere. It was not only a very fascinating sight from a scientific standpoint, but also quite beautiful." Photo and video provided by Mike Hollingshead at extremeinstability.com. Video of midge swarms in Iowa along Hwy 30 Shot by Mike Hollingshead.